Brittany, owner of Rose City Pets, has been a lifelong animal lover. When she was young she was always pretending to be various animals, such as dogs, cats, birds, and fish. Being a pet sitter is the next best thing! She has taken care of dogs, cats, fish, birds, guinea pigs, chickens, ducks, rodents, snakes, lizards, and more! She has been a pet sitter for over a decade and is thankful for every client who hires her. She has a special affinity for senior pets and those with special needs. She is a medication ROCK STAR and has given medication such as injectables, IV fluids, pills, chewies, and liquids. She is licensed and insured/bonded and has taken classes in pet first aid/CPR. 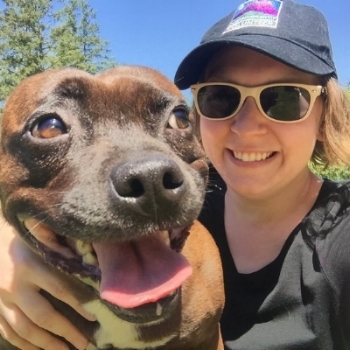 Kelly is a Portland-based pet sitter who loves playing with and caring for pets. She is an active and compassionate sitter, enjoys long walks and runs with pets, as well as cuddling with them and tending to their needs. Kelly has a dog of her own who loves to go on walks (with frequent sniffing breaks) and cuddle up on the couch. Kelly works a full time job and is available on nights and weekends. She has open availability during the summer break months. Valerie is an animal lover and a true friend to cats and dogs. She feels lucky to have cats of her own and treasures each animal she meets! She would love to hang with your fur friends for play, walks, or just some quiet petting. Valerie is available for all manner of drop ins and your pet's comfort and safety will always be her top priority. She has a flexible schedule and can’t wait to meet you and your pets! Amanda is south Beaverton based pet-sitter who grew up on a farm with a horse, cows, dogs, cats, chickens, ducks and turtles in her pond. Although she has not had animals of her own for a few years, she has spent her free time caring for her friends and friends of friends’ dogs, cats, fish and chickens. Amanda is an animal lover at heart, so she is the first person that people who know her think of, when they need someone to watch their pets. Amanda has a full time job, however, if scheduled in advance, she could work remotely but would need reliable high speed WiFi access and a kitchen table and chair to do her work. She is looking forward to meeting you and your fur babies. She has taken a class in pet first aid/CPR and has pet sitting insurance. Preferred zips: 97005, 97006, 97007, 97008, 97123, 97124, 97225. Robin loves EVERY animal - especially yours! They are excited to snuggle, walk, tend to, and play with your pets! Robin's adventures have given them experience with animals of many kinds (including and especially goats). They don't have any pets at home, but enjoy having a job that allows them to care for and love on animals just the same! They are not squeamish about special needs animals and are exceptional at keeping a schedule! Tabitha is a very active pet lover. Camping and farming, roller derby and weightlifting, teaching yoga and hiking with dogs are some of her favorite pastimes. She is ready for the challenge of tiring out your most active pups. Tabitha also gives great belly rubs and ear scratches and has some excellent laser pointer skills for those indoor cats who want to hunt. She has a lot of experience with senior animals who may have special medications, dietary needs or mobility issues. Tabitha has pet insurance and can’t wait to send you boomerangs of your furry friends while you are away. Amy no longer lives in Portland, but still comes back to help out Rose City Pets from time to time! She loves dogs and cats, and would love to meet yours! She has the most experience watching over cats, from toe-biting kittens to senior kitties. She has administered medication to very stubborn felines multiple times a day for long periods of time. When watching your dog or cat, you can be sure that it will be her top priority! She lives in Nevada with her tuxedo cat, Lt Kitty Picard Stewart.